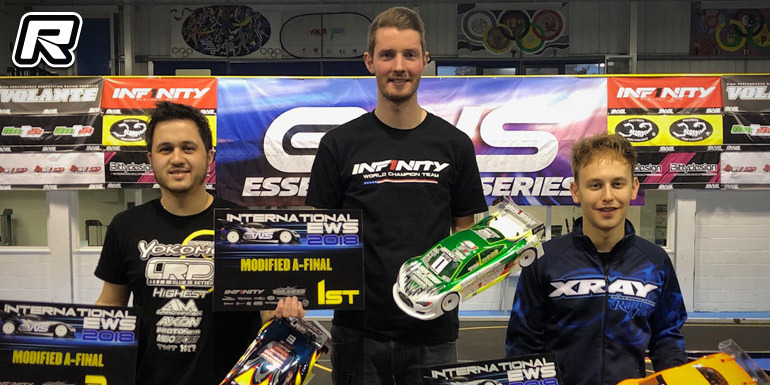 The 2018 EWS International, held this past weekend in Thundersley near London, concluded with a victory for Infinity’s Yannic Prümper. After sitting atop the standings after Saturday’s qualifying rounds, the German driver secured pole position in a very tense final qualifier on Sunday morning. With Elliott Harper looking like his strongest challenger for the overall TQ, it was the British driver who led the final round initially with his Xray. However, in the final minute of the run, a small mistake from Elliott allowed Yannic to close within a tenth of a second, before Pole Position was decided on the very final lap as Elliott ran a little too much kerb coming onto the back straight for the final time, giving Yannic the win and the overall TQ by just two hundredths of a second. 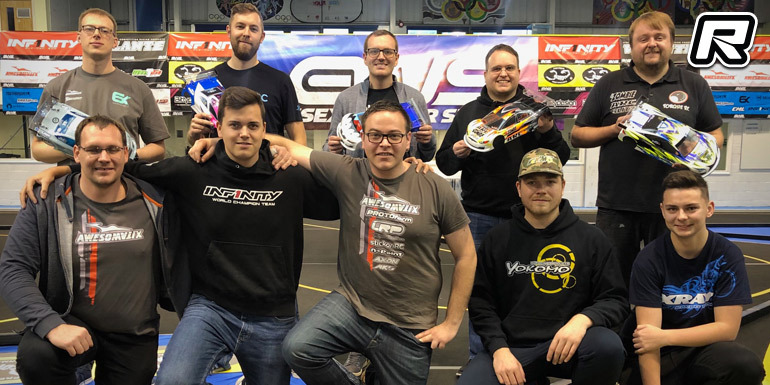 The close racing out front allowed Yokomo’s Ronald Völker to also move into the mix, taking third in the round just one and a half tenths behind the leading pair, which in urn secured him fourth on the grid behind Marc Rheinard. A1 got underway with Elliott following Yannic closely for the first minute and a half, before a traction roll at the end of the straight dropped him down the field. This allowed Yannic’s Infinity team-mate Marc to take up the challenge, but he too threw away the position a few laps later with a small bobble, which in turn promoted Ronald, the defending race winner, into second place and he set about catching Yannic. It initially appeared that the lower grid spot was going to prevent Ronald from mounting a full challenge for the win, but after reeling off a set of fastest laps, the 2014 World Champion closed in on the 2018 European Reedy Race winner. As time wound down, Ronald got to within a few tenths of a second of Yannic, but wasn’t able to make a serious attempt at lining up a pass, and thus Yannic held on to take the win, with Ronald’s Yokomo team mate and veteran of every EWS International, Christopher Krapp, coming through to take third in the leg in front of Brits Olly Jefferies and Kyle Branson. Leg two saw a carbon copy of the start, but this time Elliott made a mistake on just lap two, again promoting Marc into second and Ronald to third early on. Once again, however, a small error from Marc left Ronald in second – but this time much earlier in the race. Ronald used this earlier advantage to pressure Yannic and managed to make a robust pass on his compatriot and held on to take the win. This time, Elliott remained in touch after his mistake, closing in on Yannic but having to settle for third at the end, with Christopher moving into fourth and Marc having to settle for fifth in the race. The final leg and final race of the weekend would therefore decide the overall winner of the event. This time, there were no early mistakes from the top four and they circulated in grid order, running nose-to-tail to the entertainment of the crowd and demonstrating how great close Touring Car racing can be. Ronald managed to make a pass on Marc at the half-distance point after the three-time Touring Car World Champion ran a little too much kerb, whilst at the very front Yannic spent the entire five minutes defending his position from a hard-charging Elliott, who in turn had to worry about the attacks from first Marc and then Ronald. After five minutes of intense racing, however, Yannic had managed to soak up all the pressure and crossed the finish line to take victory and thus the overall title. Elliott’s second place in the third leg elevated him to third overall, with Ronald’s earlier results giving him the runner-up position. 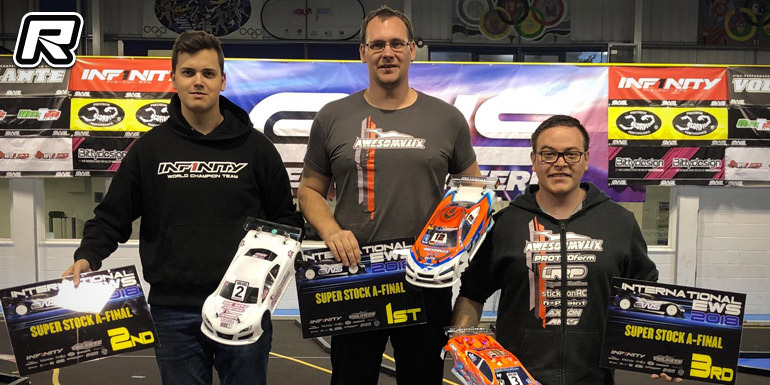 Over in the Super Stock class, Infinity’s Dominic Vogl took the final qualifier on Sunday morning, to bump himself up to second on the starting grid, with Christian Donath confirming his overnight TQ for Awesomatix. This relegated Max Mächler to third on the grid, the Awesomatix team manager starting in front of Yokomo’s Martin Hofer and the top Xray of Daniel Blake. The A-finals saw some intense racing as we have often seen in Super Stock racing. Pole sitter Christian was able to secure the leg one victory after pulling out a small lead over Dominic in the early stages. Martin moved ahead of Max in the early stages, before dropping back and allowing British drivers Jon Bowden and Billy Fletcher to come through to take third and fourth respectively. The second leg saw Dominic giving up second position early on from a small mistake allowing Max to act as rear gunner for his team mate in the early stages. However, Christian made a small mistake, rolling from one of the kerbs, which allowed Max to inherit the lead just before the half-way point. 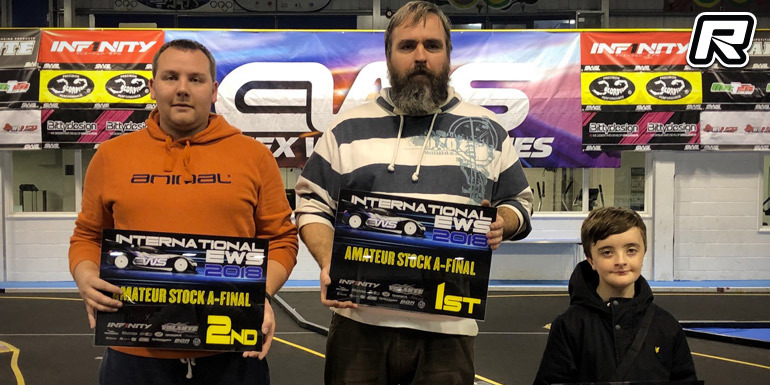 Max, the defending race winner, held on to take the win from Christian, with Dominic holding down third place as Billy Fletcher again had a good race and moved into fourth and EWS stalwart Tony Broad rounded out the top five. The final leg would also see the title decided, with all of the top three starters in with a chance. A poor first lap from Max saw him drop down the order and essentially out of contention to retain his title, and allowed a battle for the win and the overall victory to play out between Christian and Dominic. Dominic looked to have the faster car but struggled to find a way past Christian – the two coming together a couple of times, but each time Dominic did the right thing and waited for Christian to recover the lead. This allowed Martin to close in, but the leaders had a little more pace and each time could pull away. Finally Dominic forced Christian into a small error, the Awesomatix driver traction rolling and allowing the Austrian into the lead in the final minute of the race. Dominic ran out the winner, but Christian took the overall victory thanks to his faster leg one time. 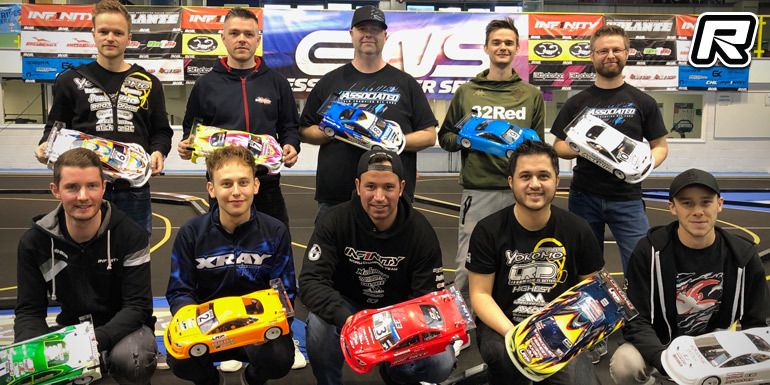 In the Amateur Stock class, Billy Kavanagh confirmed his pole position with a Q4 TQ run, ahead of Adam Malins and Jamie Murray. However, leg one of the finals saw young Shane Chipolina come through from fourth place to get one of the biggest cheers from the crowd all weekend and take the victory, with Billy finishing second and Jamie third. Billy fought back and took a commanding leg two win, ahead of Adam, Sage Young and Shane – meaning the class would be decided in leg three as well. This run saw Billy having one of his best runs of the weekend, whilst Shane would unfortunately hit technical problems, essentially handing the victory to Billy as he retired just before the four-minute point. Adam again came into second place, which was enough to net him second overall and push Shane into third in the final standings. 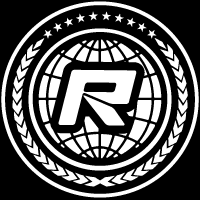 The 2019 EWS International is already being planned to build on the success of the race which is now firmly cemented on the international touring car race calendar.